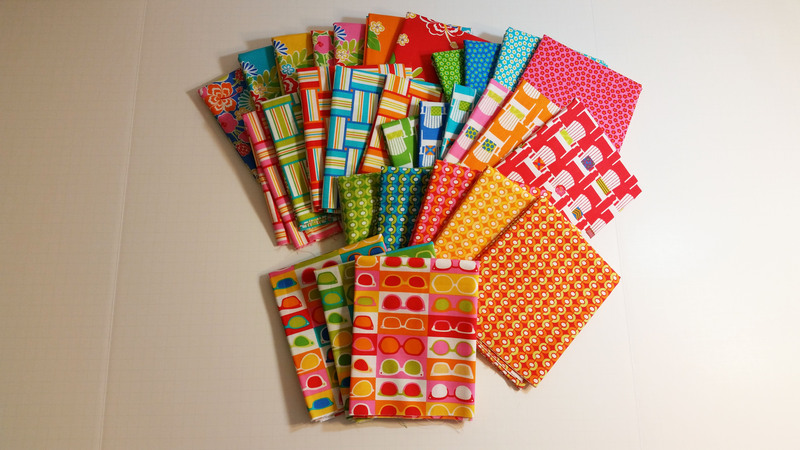 When Gina asked me to join her Blog Hop for her new fabric line, I leapt at the opportunity. 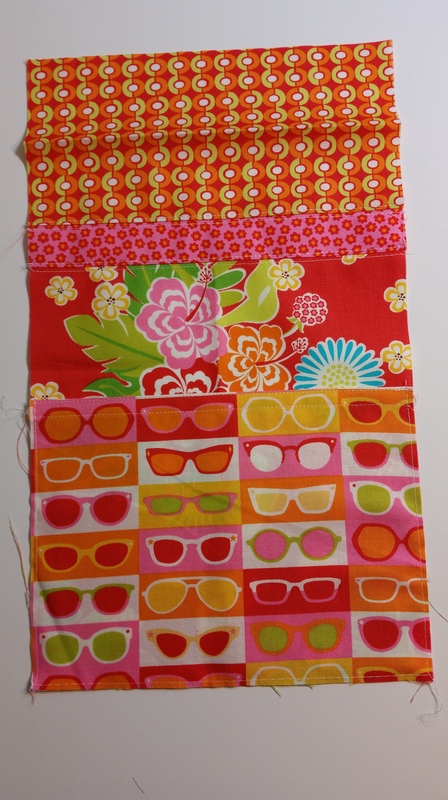 This fabric is so bright and fun and lovely. 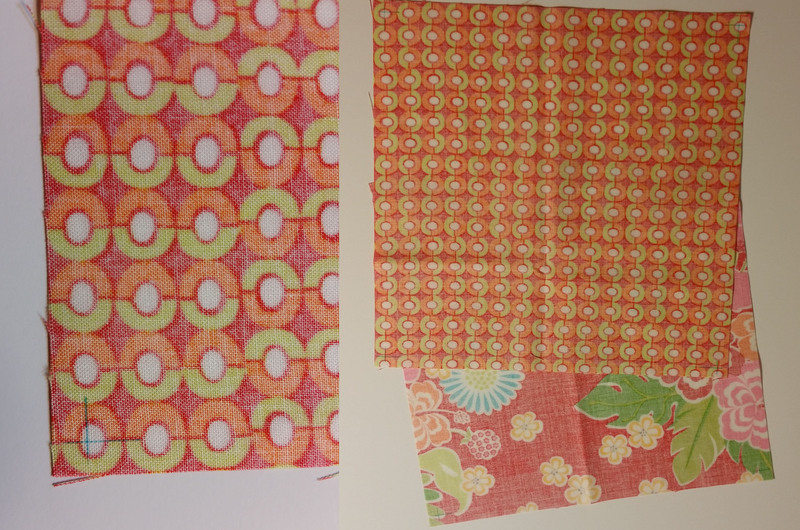 Plus, I love working with Moda fabric. Gina illustrated all sorts of things that represent summer. Sunglasses, Beach Chairs, Big Giant Flowers, Vibrant colors, Fun. I wanted to give you a tutorial that a beginner can do, but may push your skills a little. I have a fun giveaway as well. Comment on this post with your favorite summer vacation as a child and you’ll be entered. I’ll draw a name at random on Sunday, April 12th and contact by email. The other blogs on the hop are listed at the bottom and they have giveaways as well. 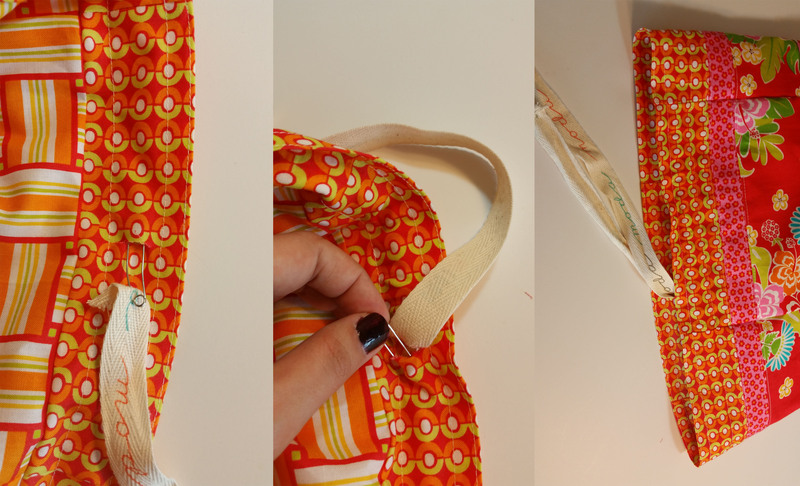 I had been wanting to make this little bag for a while. The idea has been ruminating for some time in my head and this presented the occasion for it. Square bottom and round top, fantastic!! Before you get too worried (Y-seams…AHHHHH!! ), they’re not that bad. Seriously, y-seams are more intimidating than they are difficult. Don’t be disheartened. I’ll take you through them step by step. And…lots of pictures. Fold flange piece WST and press in half. Steam will help get a crisp line. you want a definite line so you can find the halfway point later. 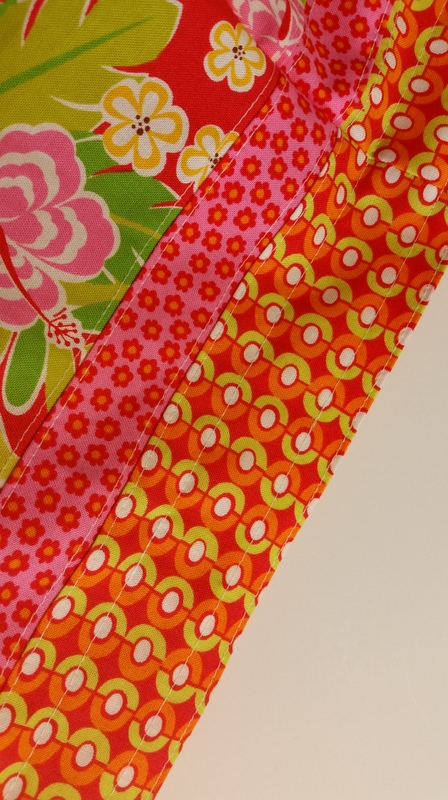 Topstitch 1/8″ from both the bottom of fold and the top edge. Attach accent piece to main body piece. 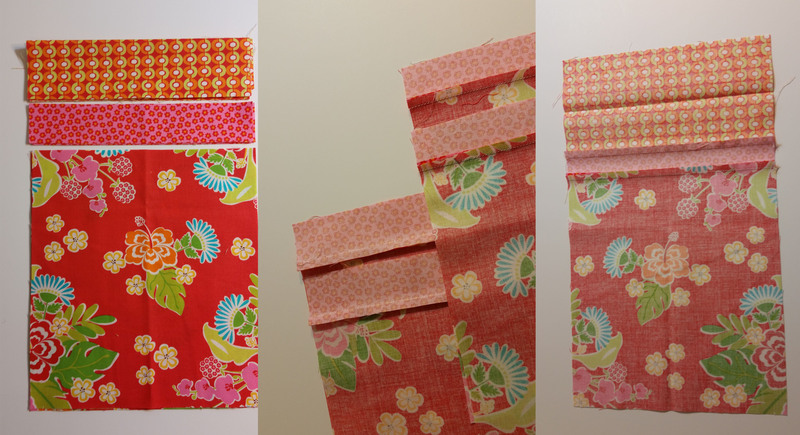 Press the 2 sides that will have pockets toward the main body and the other 2 sides toward the accent piece (that will make sense later). 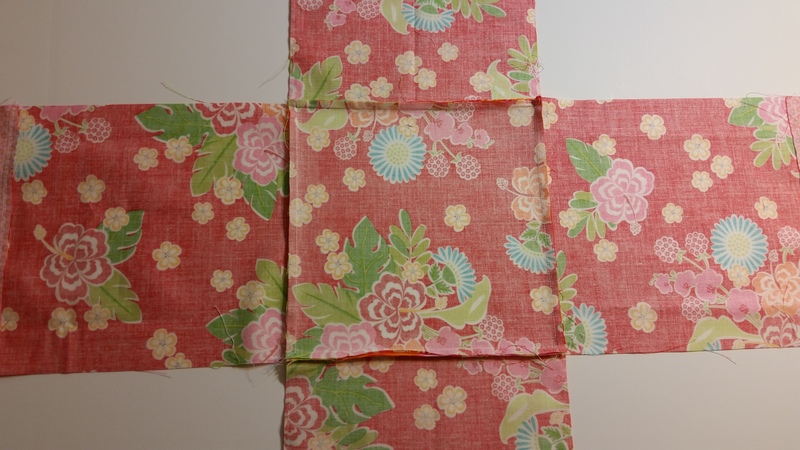 Take 2 main outside pieces with the seams pointed in the same direction. Layer pocket face up on outside matching the bottom and side seams. 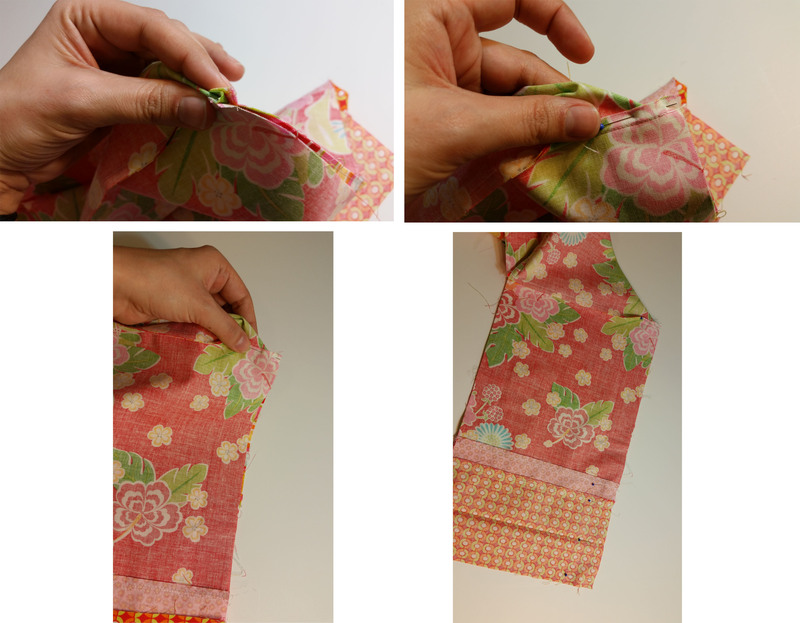 Baste along bottom and sides of pocket. On the wrong side of both the inside and outside bottom pieces, mark 1/4″ from each edge at the corners [TIP: Do NOT use a marking too that is removed with heat]. 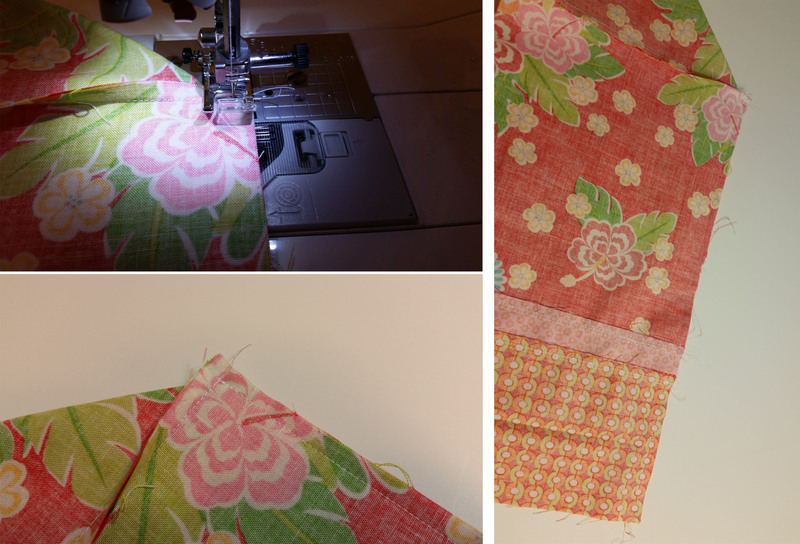 Sew opposite sides to the bottoms starting and stopping (and backstitching) at your marks. 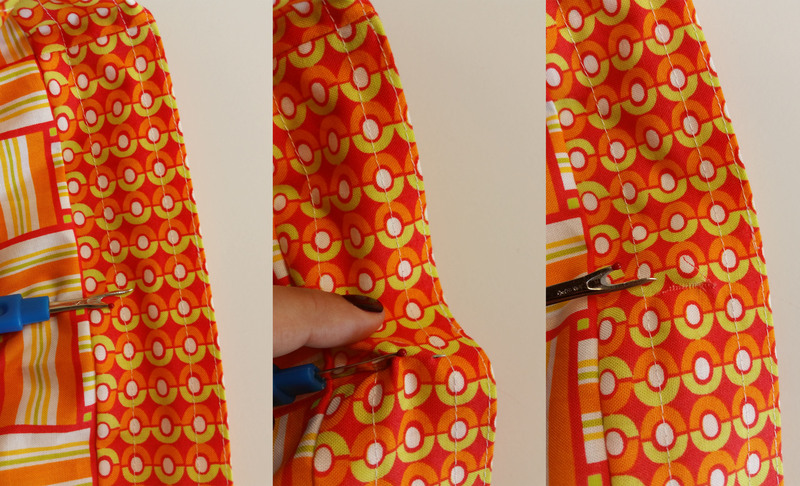 Do this for both the outside and the lining. 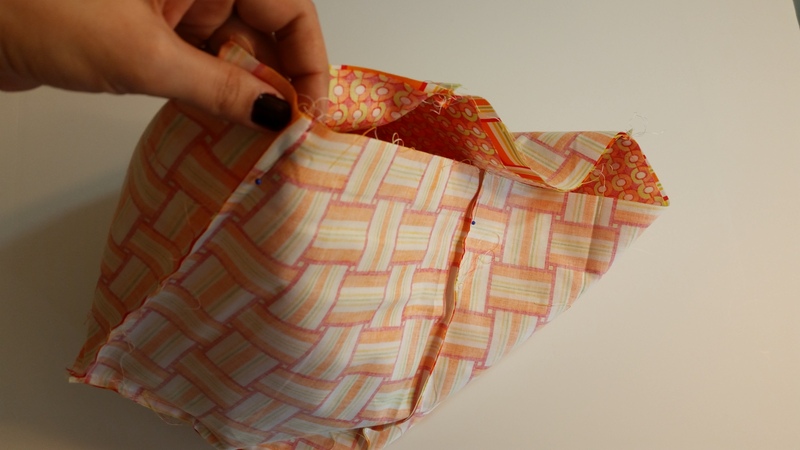 Leave a 4″ opening on one of the lining sides for turning later. Press seams towards the sides. Attach remaining sides in the same manner. This part is a little bit difficult [TIP: PIN!!] 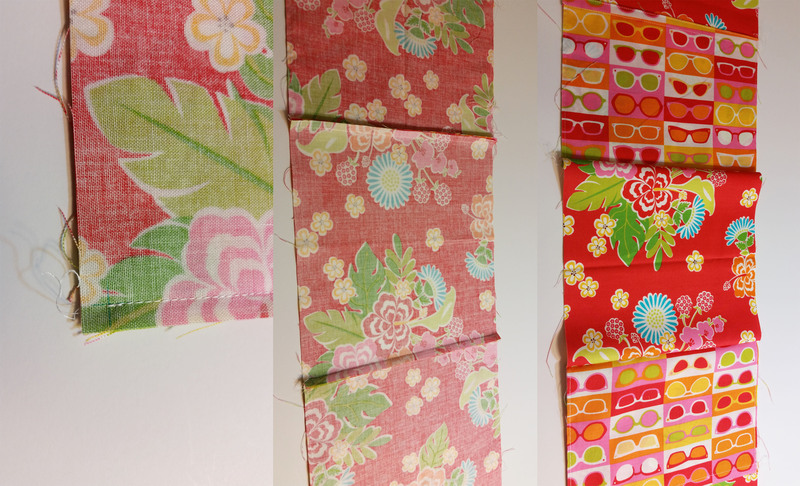 Press seams towards sides. First of all, BREATHE. 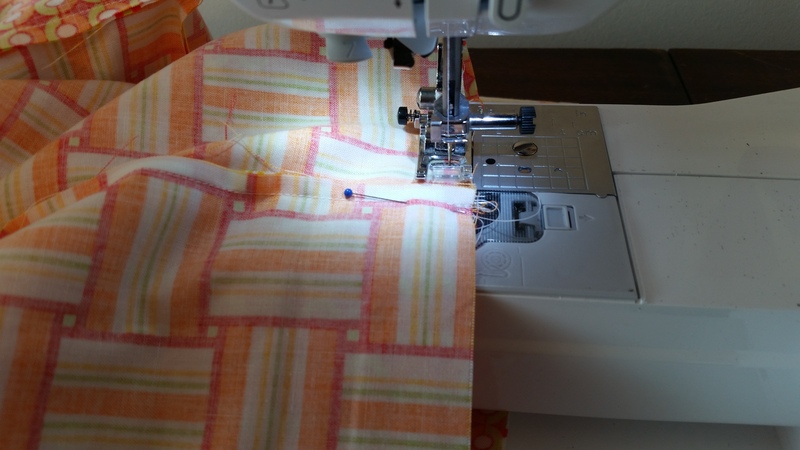 Y-seams are really easy. Just take it one at a time. 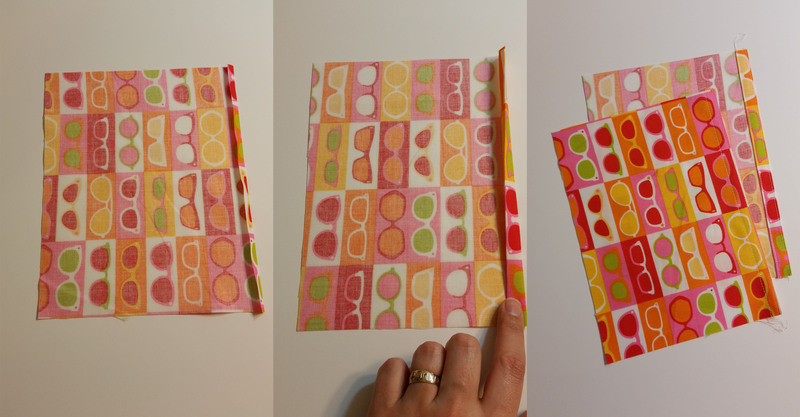 I recommend starting at the bottom corner first and sewing your way up the side. You’re going to sort of fold the bag into a triangle shape. Make sure you pull the bottom out of the way. 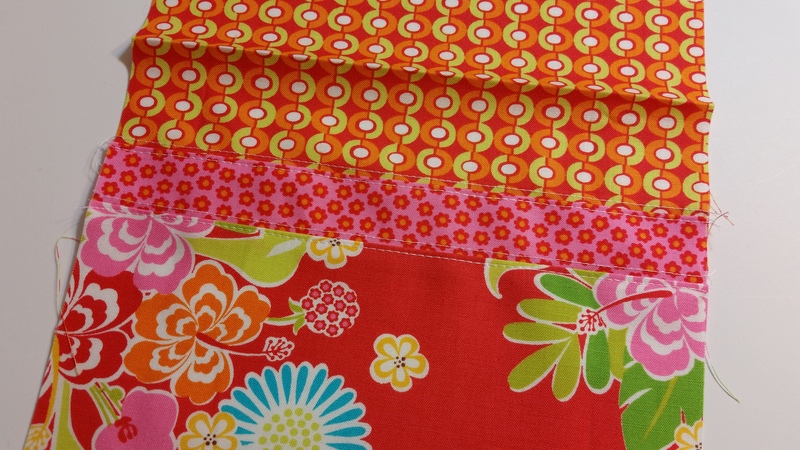 Place the outside inside the lining RST matching seams and pin. Turn bag though opening in the lining. 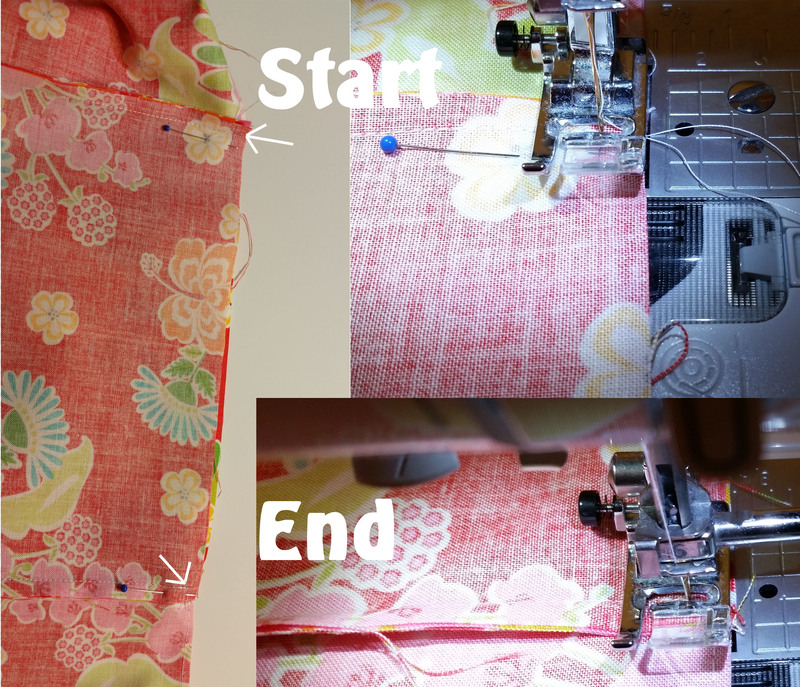 Sew the turning opening closed by sewing about 1/8″ along the edge. 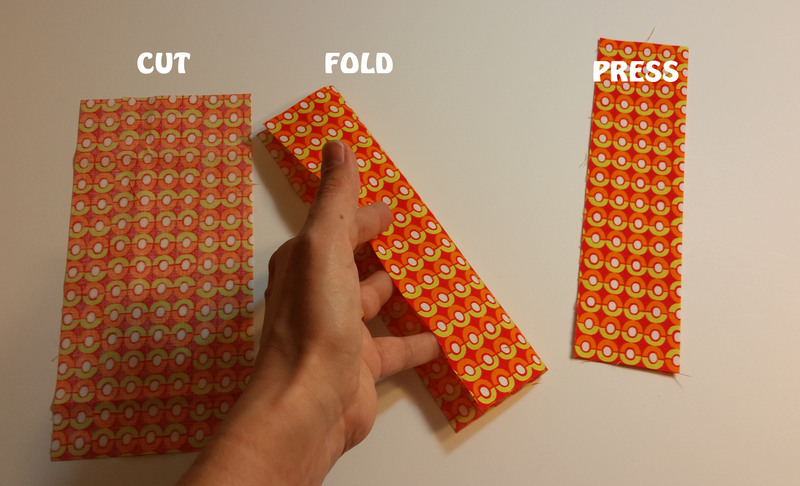 Push lining inside, folding along the fold you pressed in the flange. 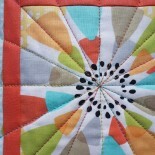 Topstitch around the top edge of the flange. 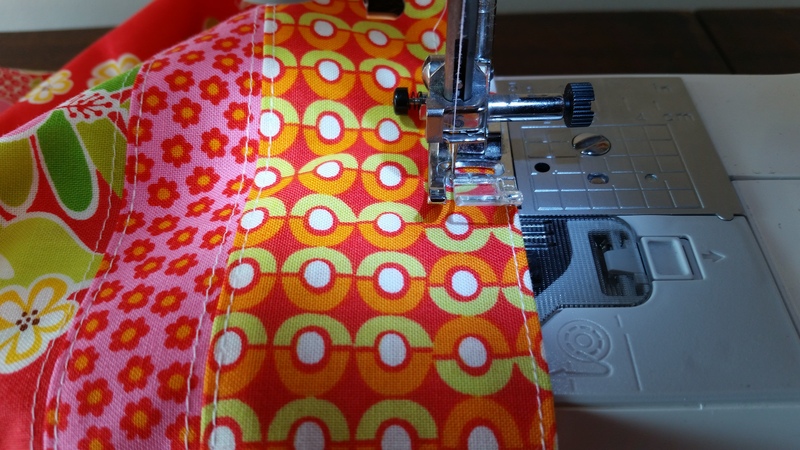 Sew around flange 1/2″ on either side. This will leave 1″ between for your ribbon. 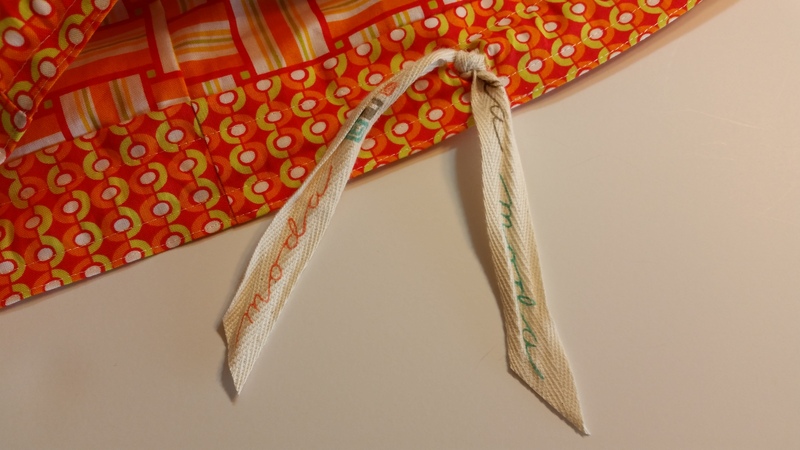 Insert seam ripper on the inside of the flange where you want the drawstring to pull. MAKE SURE YOU DO NOT CATCH THE OUTSIDE OF THE FLANGE IN THE SEAM RIPPER!! Rip a hole slightly wider than your ribbon. 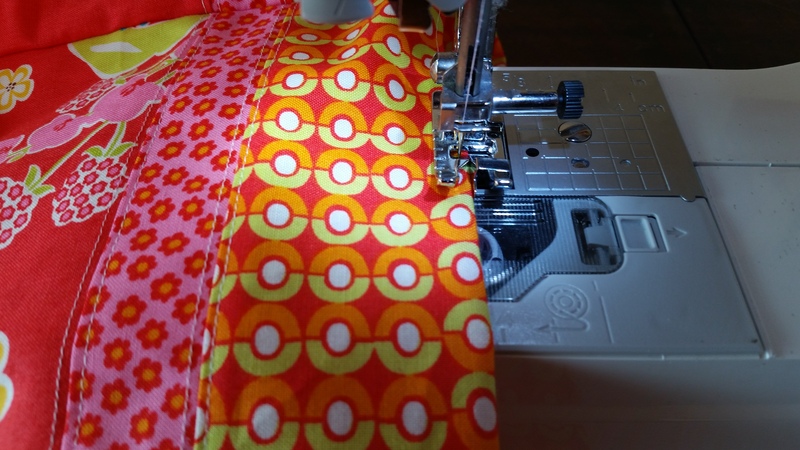 Attach the safety pin to one end of your ribbon and feed it through the flange coming out in the same hole. Open the bag completely and double knot the ribbon at the opening. Trim ribbon to desired length. Pull tight and you’re done. YAY!! 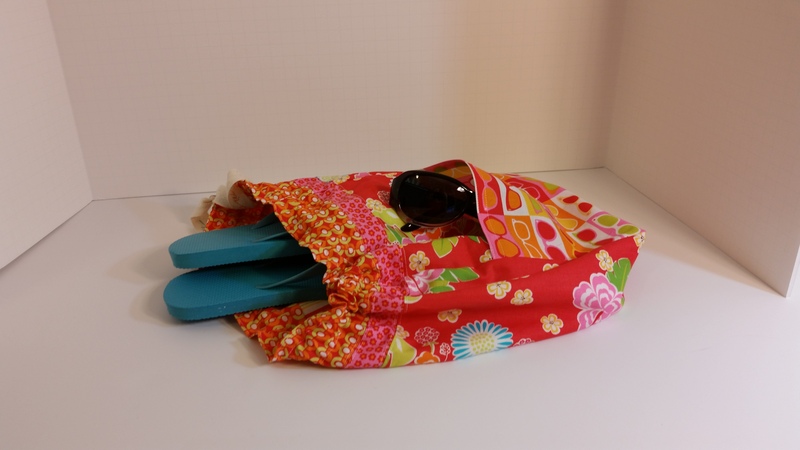 Perfect for taking to the beach or pool. 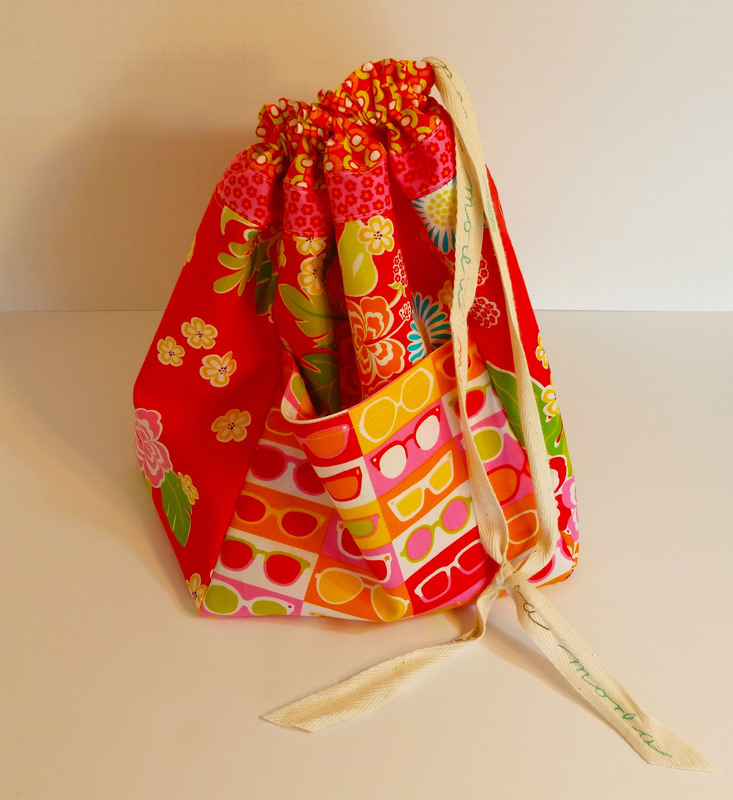 Or if you just want a little handbag. 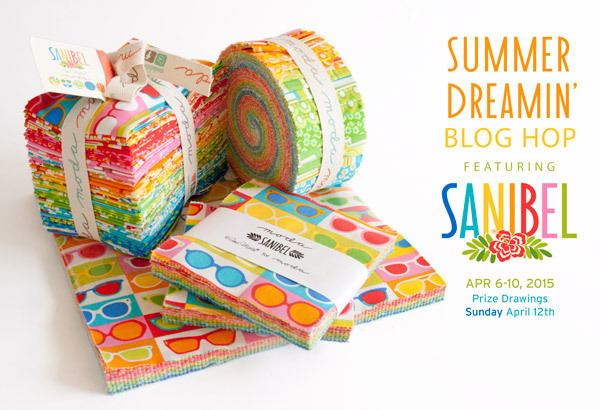 Don’t forget to check out all of the blogs on this hop for more fun and more giveaways. What a fun bag! Thanks for the tutorial! i love the fun giveaway question! Every summer when I was little my mom would load us up into the minivan and drive us all (theres nine of us total these days) 9 hours away to our grandmas, and all of her siblings would bring their kids along, and we would have a week of cousin time. The Calgary zoo, a giant petting zoo called Butterfield Acres, Super soaker fights, and tinfoil boats down a gutter. tinfoil boats were always a highlight for me. thanks for the trip down memory lane, and this giveaway! Love this bag!! 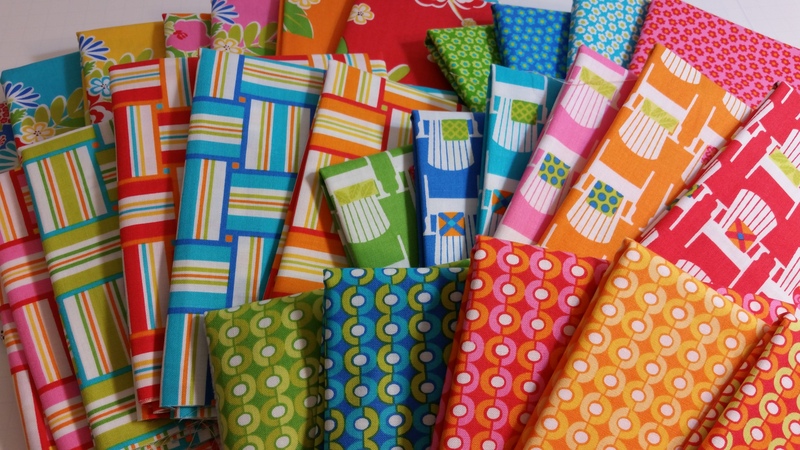 Fun fabrics. My favorite childhood vacation was going to Minnesota with my entire extended family. We’d swim in the lakes and do lots of fishing! My favorite vacation is going to visit family in WV. When I was 11 we went on a long road trip from Washington to California, and stopped at Knott’s Berry Farm. It was amazing! Hmmmm……probably staying in Gatlinburg at a very special motel and playing mini golf down the mountain side after riding up in a rail car….fun times! And since I lived at the beach at the time, a real treat! 😉 Thakns for the great tutorial too! Every summer we went to Patrick Creek Lodge in Northern California. I have such great memories of fishing, hunting for blackberries, reading by the creek. I pretended I was every storybook kid from Caddie Woodlawn to Laura Ingalls Wilder, at home in the woods–a far cry from the suburban beach bum I really was. It is not just idyllic in my memories; I returned there as an adult, and the Lodge and the area are idyllic, as were the times we spent there. We never went on long vacations as kids but sometimes Dad would come home on a Friday night and say… “Pack up the car, we’re heading out.” And away we’d go. Sometimes we’d end up at a lake, one time we went to see the Badlands, another time the Rockies. We’d be back home by late Sunday. Those trips were always a mini adventure. We never really went anywhere when I was a kid. There were 7 kids in our family. However, I loved to go down to the park and go fishing and pick wild berries. We always said we would pick enough berries for grandma to make a pie. Ha. The berries never made it home. This is a great bag. Thanks for showing the secrets to y-seams. We didn’t really go anywhere on vacation when I was a kid. We spent a lot of time at the meadow near our house. Just before I left for college we went on a short trip to hot springs and drove a loop around from Skagway to Haines Alaska. It was an incredible experience. We used to go to the Okanagan every summer. It was wonderful, except for the sunburn (being a redhead–ouch!). 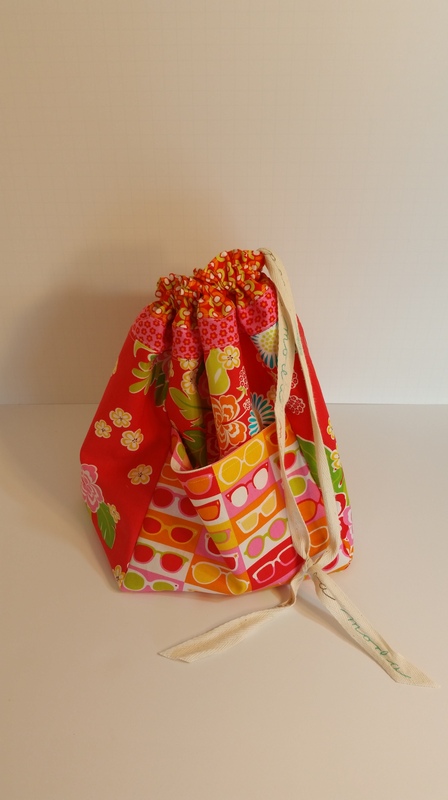 Cute beachy bag! 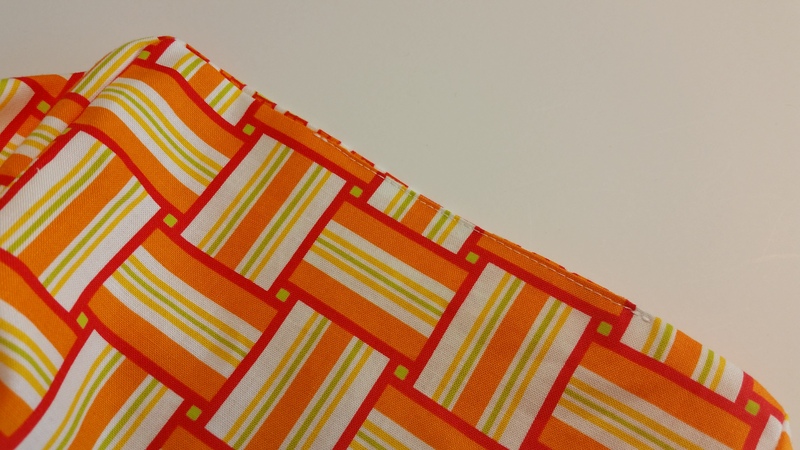 The fabric is perfect! My favorite trip as a child was one we took to Niagara Falls. 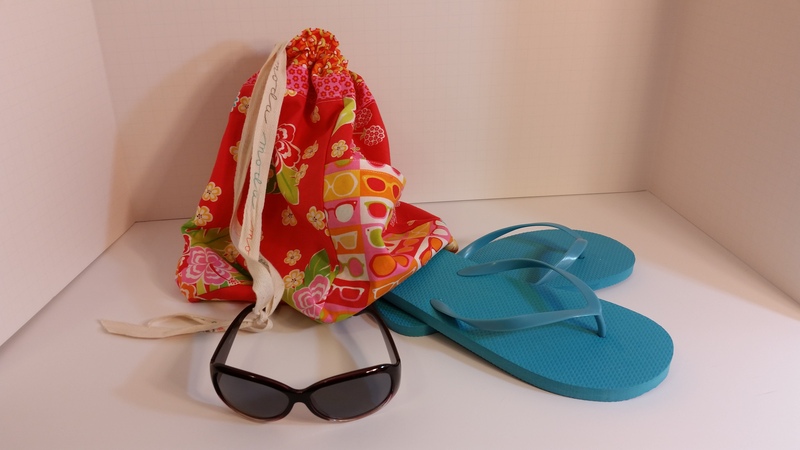 This entry was posted on April 8, 2015 by denisekbane in Adventures, My Projects and tagged bag, beachin, beachy, chair, drawstring, dreamin, dreaming, flowers, gina martin, hop, moda, sanibel, summer, sunglasses, tote.